There's an opulent, ambitious newcomer in Healdsburg, California, a little Sonoma town once known for its laid-back vibe and excellent taquerias. Dodging the Champagne and caviar cart, writer Benjamin Wallace settles into his seat to explore the luxe Cyrus experience. In the kitchen of the year-old restaurant Cyrus, co-owners Douglas Keane and Nick Peyton are debating whether last night's special martini, crowned with a slice of $1,700-a-pound white Alba truffle, was excessive. Peyton, the maître d', shrugs and says he "didn't get it." Keane, the chef, loves that "it was over the top." No question it was over the top—Keane gets such a kick out of lavishing his customers with luxurious ingredients that even his business partner can't begrudge him. Keane, 34, and Peyton, 58, are refugees from the San Francisco dining scene—they first worked together at Restaurant Gary Danko in 1999—and their arrival in the Sonoma town of Healdsburg, California, challenges all kinds of wine-country orthodoxy. For one thing, Keane's food is a departure from Sonoma's rustic culinary style, with its allegiance to regional, seasonal ingredients: He prefers old-world indulgences (caviar, foie gras, truffles), Asian flavors (yuzu, fermented black beans, curry paste) and classic French technique (lots of searing and sauces). Part of this is a reaction against the ethos of letting ingredients speak for themselves that chefs all over America, influenced by Northern California pioneers like Alice Waters of Berkeley's Chez Panisse, have been repeating like a mantra. "It's a great tomato," says Keane. "Well, do something with it. Why are you paying me?" Sure, he could make a perfectly delicious risotto using just red wine and meat stock, but why stop there? "I use more truffles and more butter to make it richer," he says. "Then I make a Parmesan broth, reduce it, aerate it, and use it as a froth surrounding the risotto." Is that all? "Now I throw a slice of truffle on, 'cause I'm a nice guy." In a part of the country best known for its laid-back approach to the good life, Cyrus's 65-seat dining room, with its vaulted ceilings of waxed Venetian plaster, conjures a formal European restaurant. The modern cooking and ingredients come swagged in old-world elegance: Coriander-lime broth is poured tableside and there's a preprandial Champagne and caviar trolley with varieties like Uruguayan osetra. But Peyton makes all this formality feel playful at the same time. The approach is freewheeling: You can choose any dishes from any areas of the menu for your three-, four-, five- or seven-course dinner. Want seven desserts and nothing else? Done. With the opening of Cyrus, Healdsburg, formerly a poky farm town ringed by prune orchards, is ready to take its place as a world-class food and wine destination. Its ascendancy began about four years ago, when Charlie Palmer, the big-deal chef and co-owner of Aureole in New York City and Las Vegas, opened his New American restaurant Dry Creek Kitchen. Healdsburg still has some terrific hole-in-the-wall taquerias, and not every bar offers wheat beer, but these days a cluster of new coffee shops, specialty food stores and wine-tasting rooms crowd two streets that flank the central plaza. During my recent visit I traipse from the Cheese Shop to Flying Goat Coffee to the eco-friendly La Crema winery tasting room. At Plaza Farms, a market that opened last June to showcase Sonoma County purveyors, I have a memorable pork-cheek sandwich from the excellent Bovolo restaurant. The new Les Mars Hôtel, the ground floor of which houses Cyrus, expertly pulls off boutique-auberge decadence. My room is strewn with antiques, including a 19th-century armoire with a safe designed to hold a laptop. Cyrus, which critics have hailed as Sonoma's answer to Napa's French Laundry, fits right into this setting. At Restaurant Gary Danko, Peyton was already a top San Francisco maître d'; Keane, an up-and-comer with San Francisco's Jardinière and New York City's Four Seasons and Lespinasse on his résumé, was Gary Danko's sous-chef. Peyton and Keane soon began to talk about doing something together. In 2002, their friend Bobby Stuckey, now co-owner and sommelier at Frasca in Boulder, hooked them up with a developer who was planning a luxury boutique hotel in Healdsburg and looking for a showpiece restaurant to anchor it. The pair started putting together the plans for Cyrus, but it would take almost four years for construction on the hotel to be completed. In the meantime, Peyton and Keane needed to make a living, so they opened a casual Napa spot, Market. Then, two years ago, Keane was diagnosed with a brain tumor. Initially, doctors thought it could be malignant, but the tumor turned out to be benign; save for a bum leg, related to a complication from his surgery, Keane has emerged healthy and seemingly unscathed. The positive outcome of all the delays is that Keane had ample time to design his dream kitchen—a 1,500-square-foot space filled with his hand-picked appliances—and he and Peyton had time to assemble a passionate, brilliant team. There's pastry chef Annie Clemmons, who previously worked at San Ysidro Ranch, outside Santa Barbara. She auditioned for the Cyrus job by cooking for Peyton and Keane in her new and still sparsely furnished apartment (her prospective employers sat on the floor). She is currently obsessed with an obscure Tibetan fruit called the Goji berry, a small treatise about which she has tacked to the kitchen wall. Just now she's using it to make a syrup that waiters fizz tableside, with an antique seltzer bottle, to make "sody pop." Sommelier Jason Alexander, who had worked at Restaurant Gary Danko, spent five days a week in the months preceding the opening of Cyrus driving up from San Francisco to meet with Sonoma's small producers; he has assembled a 750-label wine list, strong in both Sonoma and European bottlings, that plays to Keane's menu by emphasizing high-acid whites. It's also a list that encourages exploration, with lots of half-bottles, Champagnes, sakes and wines from all parts of Sonoma, including a cool-climate Syrah from Pax Wine Cellars in the Russian River Valley and a Pinot Noir from tiny producer Salinia (40 cases) in the Green Valley. "For me, there's more diversity of styles and varietals in the Sonoma area than anywhere else in the world," Alexander says. On a recent Saturday evening at the grand old bar up front, mixologist Scott Beattie pesters a waiter going home to his parents' Kentucky tobacco farm to bring back some tobacco leaves for drink experiments; Beattie already browbeat four distilleries into sending him samples of the branch waters used in the whiskey-making process to serve alongside their bourbons. After chatting with Beattie at the bar, I take a seat in the middle of the dining room just as the restaurant is filling up. Keane starts me off with an amuse-bouche: a small slab of hamachi (Japanese yellowtail) topped with a dollop of uni (sea urchin), a tangy carrot salad and a vinaigrette made with yuzu (a Japanese citrus). Next comes a trio of greens: a cake of Swiss chard with a bread-crumb crust, endive glazed with maple syrup, and a decadent creamed spinach lush with mascarpone. A red wine risotto arrives laden with white truffles, making the next course—a delicious roasted squab with a plummy hoisin sauce—seem restrained by comparison. For the fish course that comes next, Keane sears sea bass fillet until it's crispy and serves it with matsutake mushrooms in an intense dried-scallop broth. The food is spectacular, but what makes Cyrus remarkable is the entire experience: The frozen lemon-and-verjus lollipop that Clemmons sends out for an intermezzo; Alexander's description of an heirloom sake made from a rice considered extinct for 2,000 years; Peyton's waxing on about the Carles Roquefort, a ewe's-milk cheese that is "the last of the homemade Roqueforts" (its producer cultures his own penicillin spores). In the kitchen, Keane is still struggling with his weakness for truffles. As orders start coming in, sous-chef Drew Glassell slides a risotto to Keane. Though the diner hasn't paid the truffle supplement, Keane shaves a slice of black Périgord (merely $500 a pound) onto the dish anyway. Almost guiltily, Keane looks across to Glassell. "Do you think that's stupid, Drew?" Glassell tactfully contends that one truffle slice doesn't deliver enough flavor to make it worthwhile. Keane promises (unconvincingly) to hold back next time. 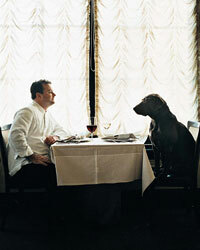 Cyrus is located at 29 North St. in Healdsburg, CA; 707-433-3311. Benjamin Wallace is an editor-at-large at Philadelphia. He is writing a book about the most expensive wine ever sold.